David Brock, the president and CEO of the George Soros-funded character assassination factory, Media Matters for America (MM), which euphemistically describes its mission as “comprehensively monitoring, analyzing, and correcting conservative misinformation in the U.S. media,” isn’t even pretending to be nonpartisan or fair anymore. Conservatives Have A 'Hate Based' Campaign Against Obama? Paul Waldman at The American Prospect blames conservatives for all of Obama's race problems. "For months, I've been predicting that conservatives would delicately prompt voters to see Barack Obama through the lens of race. They'd drop hints, they'd make roundabout arguments, they'd find a hundred subtle ways to encourage people to vote their prejudices, while denying vociferously that they were doing anything of the sort." Video (4:18): Windows Media (15.7 MB), plus MP3 audio (1.94 MB). GLENN BECK, host: Noel Sheppard is the associate editor of newsbusters.org, a conservative watchdog of the liberal blogs. Noel, you apparently did a Google search on this story. How out there is my bigotry? NOEL SHEPPARD, Associate Editor, NewsBusters.org: Well, I Googled "Glenn Beck," "Obama" and "Anti-Christ," and I got 744,000 hits. Now, that doesn't mean that there's been 744,000 articles already written about this. That`s a little bit nuts. 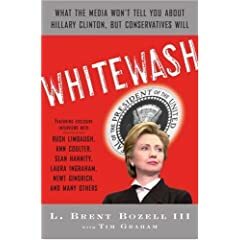 Late last year the folks who run the Media Research Center, an outfit dedicated to unmasking liberal bias, came out with Whitewash, a book about how the mainstream media have shamelessly "shilled" for Hillary Clinton. Now the people who run Media Matters for America, which is dedicated to unmasking conservative misinformation, are offering Free Ride, a book about how the mainstream media give John McCain "a positive spin for nearly everything he does." NewsBusters has frequently reported the deplorable connection between MSNBC's Keith Olbermann and the Clinton front-organizations Media Matters and Think Progress. On Friday, conservative radio host Glenn Beck marvelously illustrated just how this liberal alliance works, and showed how a few sentences transcribed by Olbermann's minions and taken out of context can easily be used to completely misrepresent their meaning and what the speaker was actually saying. The "pimped out" controversy surrounding MSNBC's David Shuster - destined to be called "Pimp Gate" - took a turn for the bizarre when Democrat presidential candidate Hillary Clinton sent a letter to Steve Capus, President of NBC News. Published for all to see at the Washington Post's "The Trail" blog Saturday, the letter demonstrated a disturbing number of hypocrisies and double standards inherent in today's liberally biased media. Last week ABC News broke the deafening silence on reporting Barack Obama's ties to indicted fixer and political influence peddler Antoin “Tony” Rezko. The rare coverage was reported here on Newsbusters and repeated across the blogosphere as people on both sides of the political spectrum reacted. (I put together a montage of the scant television coverage here). But all is back to normal now that the dust has cleared. Not only did most of the media gloss over this ever evolving story but nearly all of them took a pass on the Sun Times latest revelation that Barack Obama has surfaced as an "unnamed political candidate" in a federal indictment against Rezko on corruption charges. Chris Matthews was in full flight on today's Morning Joe, vividly expressing himself on everything from the historic shockwaves that an Obama Iowa victory would send, to Media Matters's role as a Hillary front, to the attitude of NewsBusters. But the Hardball host was especially animated in describing the way the Clintons use intimidation to keep people in line. CHRIS MATTHEWS: In the world, in the universe, the biggest American political story of modern times if Obama wins the Iowa caucuses. It will be all over the world; it will sweep the headlines in every newspaper in the world: friend, foe or neutral. It will be the Third World story of the century, of the last century [Barack's Time Machine? ], the biggest story of modern Third World history, really, if Obama wins the American presidential caucus in Iowa. First, the following article was written by my co-blogger, Jon Jay Ray. He gets all credit, I just thought it fit in at Newsbusters. Not that this will come as any great surprise, but the folks at the Hillary Clinton front organization Think Progress are at it again bashing conservatives by employing the disgraceful art of cherry-picking. For those unfamiliar with the term, this is when you take a sentence or two out of a report or article divining a meaning or intent clearly different than that the author or speaker was quite obviously conveying. In this case, the target of TP's disaffection was me. More deliciously, research associate Matt Corley chose not only to cite just fifteen words out of a 41-word sentence inside of a 2500-word article of mine, but also totally ignored the relevant subsequent question posed in the piece in order to present to his readers a completely different conclusion than that offered by moi. Joy Behar took up Media Matters talking points on her "View" forum and Whoopi Goldberg and Sherri Shepherd, whom Barbara Walters calls "very conservative," backed Behar up. On discussing Barack Obama and whether his African American race helps or hurts him, Joy Behar brought up the far left Media Matters smear of Bill O’Reilly. WHOOPI GOLDBERG: Yes he was astounded. BEHAR: -that black people use forks or something when they eat? In reality, Bill O’Reilly was using his experience to note that African-American culture is not as profane and coarse as stereotyped by many white Americans. Barbara Walters very timidly defended O’Reilly before Sherri Shepherd and Whoopi Goldberg continued. The TNR saga is slowly seeping into the media, with posts this morning at the Washington Post and the New York Times, in addition to last night's mention in the New York Observer. Not a single one of these outlets discusses the fact that Franklin Foer spent the better part of 13 pages alleging a military conspiracy spanning four bases in three countries involving dozens of soldiers, from privates to colonels. I guess they didn't want to discuss how nutty that explanation sounds. Nor did they mention that Foer and The New Republic refused to apologize to those soldiers in Iraq and Kuwait they accused of atrocities. Not a single one them acknowledges that Foer was being deceptive when he claimed back in July "the article was rigorously edited and fact-checked before it was published."